Blowout Sale! Save 61% on the Huahuamini Professional Unisex 41 Inch Scrub Laboratory Doctor Lab Coat (Medium, White) by Huahuamini at W Jacket Outlet. Hurry! Limited time offer. Offer valid only while supplies last. Professional Unisex 41 Inch Scrub Laboratory Doctor Lab Coat Material: 65% Polyester + 35% Cotton. Three-button front closure. Machine Wash.
Material: 65% Polyester + 35% Cotton. Length Size Range: 37inch -- 42inch. Package Included: 1 * Adult Lab coat Only. 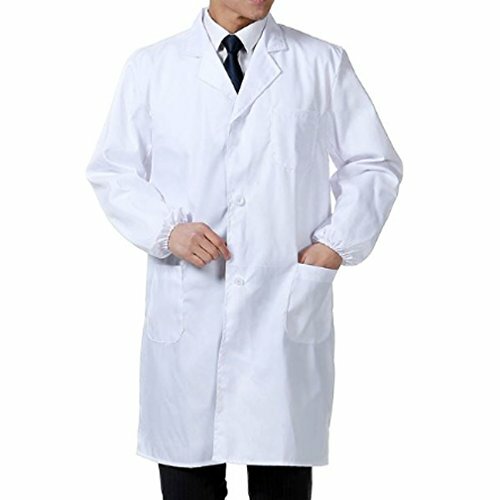 Small -- Lab Coat Length: 95cm / 37.40inch, Bust: 100cm / 39.37inch, Sleeve Length: 55cm / 21.65inch. Medium -- Lab Coat Length: 97cm / 38.19inch, Bust: 108cm / 42.52inch, Sleeve Length: 56cm / 22.05inch. Large -- Lab Coat Length: 100cm / 39.37inch, Bust: 110cm / 43.31inch, Sleeve Length: 58cm / 22.83inch. X-Large -- Lab Coat Length: 105cm / 41.34inch, Bust: 120cm / 47.24inch, Sleeve Length: 60cm / 23.62inch. 2X-Large -- Lab Coat Length: 106cm / 41.73inch, Bust: 127cm / 50.00inch, Sleeve Length: 63cm / 24.80inch. 3X-Large -- Lab Coat Length: 110cm / 43.31inch, Bust: 130cm / 51.18inch, Sleeve Length: 64cm / 25.20inch. Two lower patch pockets with side entry for easy access to pant pockets. High quality lab coats are needed to protect you in work environments with a presence of non-hazardous and hazardous chemicals and contaminants. Multiple Sizes Offered by your choosing. Please check size chart in our description to order. If you are fat and little big waist, please choose a size one up. If you have any questions about this product by Huahuamini, contact us by completing and submitting the form below. If you are looking for a specif part number, please include it with your message.